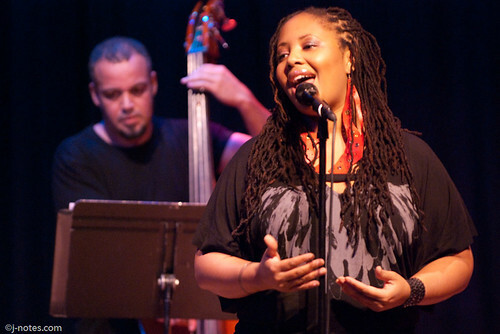 Where were you in October 1999 when Joe Sample and Lalah Hathaway appeared together at Yoshi’s Oakland performing song from their The Song Lives On album? I was there in the crowded audience sitting really close to the stage. It was an excellent concert. Fast forward 10 years to November 2009 and Joe and Lalah were back again bringing their magic. Joe opened the set with “The Freedom Sound” which he originally recorded with the Jazz Crusaders in 1961. He followed with the title track from his 1988 Spellbound album. Joe tells such great stories about the music. He told us how “Gee Baby Ain’t I Good To You” was a classic blues versus a rural blues where you moan your troubles away. The rendition he played was inspired by Nat King Cole’s 1940 rendition of this gem. It was riveting. The rhythm section included Nick Sample on bass and Xavier Breaker on drums. Lalah joined the trio and swung on “It’s A Sin To Tell A Lie” and she did some wonderful runs on “Fever.” They slowed the world down on “When Your Life Was Low” and “For All We Know” and warmed our souls with “Street Life.” Lalah playfully reminded us that name of the song was “Street Life” not “Street Lights.” They closed out their set with “When The World Turns Blue” with Joe on solo piano and Lalah laying down beautiful vocals. This was a special night that was definitely worth the wait. We just hope we do not have to wait another 10 years to see them together again. A few days after their concert, I got to interview Lalah. We talked about music, her Grammy nomination, new projects, and even Shirley Horn. Please listen. Concert photos by James Knox. Additional photos can be seen here. This entry was posted on Tuesday, January 12th, 2010 at 11:54 am. 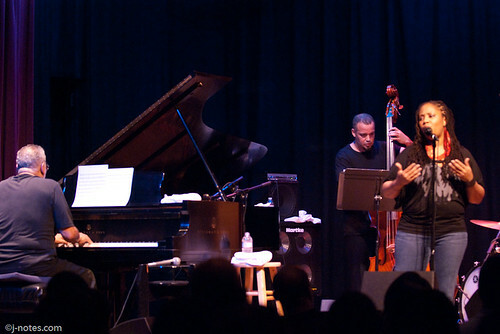 It is filed under Concert Reviews, Podcasts, Yoshi's and tagged with jazz, Joe Sample, Lalah Hathaway, live music, Nick Sample, piano, vocals, Xavier Breaker, Yoshi's Oakland. You can follow any responses to this entry through the RSS 2.0 feed.